These versatile 50th anniversary party favor boxes are a great way to thank you guests for attending the big celebration. You can fill them with candy, snacks, or maybe a favorite food of the married couple for an enjoyable party favor the guests will appreciate. Boxes are ivory with gold foil anniversary design, and measure 2" x 2" x 2". Each set includes 25 boxes. Note that ribbon and contents are not included. I want to confirm every set of 50th Anniversary Party box is 25 boxes? Yes, the 50th Anniversary Party Favor Boxes are sold in sets of 25. 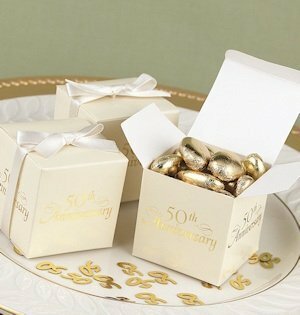 Boxes are ivory with gold foil anniversary design, and measure 2" x 2" x 2".